What does it mean to be a humanist? Is humanism a new idea? How do people live their lives without religious beliefs? 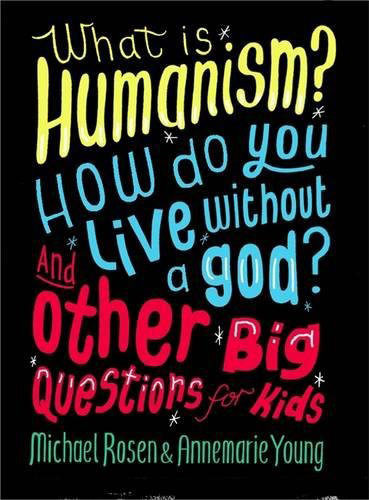 The first of its kind aimed at the new curriculum for upper primary and lower secondary school children, this book examines how humanists respond to fundamental questions about morals and ethics, the origins of life, religion and the state. It looks at how humanists mark the milestones of birth, marriage and death. How do people without belief in God live moral and fulfilled lives, with respect for humankind and the universe? This thought-provoking approach encourages readers to think about the big questions for themselves. The book includes contributions from a number of prominent humanists, such as Stephen Fry, Camila Batmanghelidjh, Philip Pullman, Jim Al-Khalili, Natalie Haynes and Shappi Khorsandi, who explain their own philosophy and tell us what is important to them. Part of the groundbreaking and important ‘And Other Big Questions’ series, which offers balanced and considered views on the big issues we face in the world we live in today.